Veit Hornung's lab has elucidated the mechanism by which human cells induce inflammation upon detection of cytoplasmic DNA. Notably, the signal network involved differs from that used in the same context in mice. Human embryonic kidney cells stained for STING (magenta) and a lysosomal marker (green). 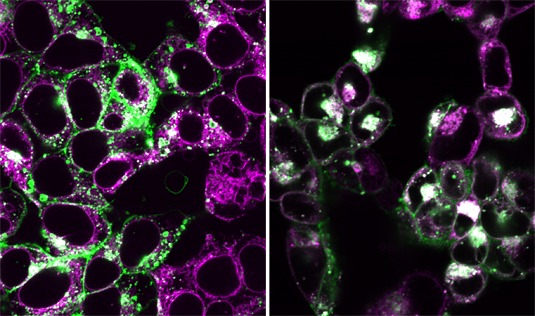 In the non-stimulated state (left) the staining patterns are distinct, but after activation (right) STING is associated with the lysosomes, as indicated by the merging of the two fluorescent signals to give white. In eukaryotic cells, the hereditary material DNA is mostly confined to the nucleus whereas the presence of DNA outside of the nucleus in the cytoplasm is a sign of danger to the cell. Cytoplasmic DNA may originate from bacterial or viral sources and thus indicate an infection or it can be of endogenous origin and pinpoint to tissue injury. Consequently, its recognition by the innate immune system induces broadly inflammatory counter measures anddefense mechanisms. Professor Veit Hornung and his team, have now elucidated the mechanisms that enable the innate immune system in human cells to recognize such misplaced DNA and trigger an inflammatory reaction. Disproving the common assumption that innate recognition processes are evolutionarily largely conserved, in this particular case, Hornung and colleagues reveal that human cells differ fundamentally from mouse cells with regards to cytosolic DNA recognition. The new findings appear in the latest issue of the leading journal Cell. Cell. 2017 Nov 16;171(5):1110-1124.e18. doi: 10.1016/j.cell.2017.09.039. Epub 2017 Oct 12.